This autumn, when evening skies are getting darker, join us at the UAlberta Observatory for a stargazing tour that’s out of this world! Our host, Dr. Sharon Morsink of the Department of Physics, will be opening the Observatory for us to enjoy views of the waxing crescent Moon, the planet Mars and the real-life lord of the rings – the planet Saturn, and other celestial delights. We’ll begin with a short presentation about the Observatory and then tour the heavens through the state-of-the art telescopes. Join us on Friday, October 7, 2016, 6:30-8:00 PM at the Department of Physics Astronomical Observatory is located in CCIS 5-240 on the West end of the 5th floor of the Centennial Centre for Interdisciplinary Science on the main campus of the University of Alberta. Click here for directions. Q: The weather isn’t very nice. Will the event still happen? A: Yes, even if it is raining or snowing. We won’t be able to see the stars, but event will still take place. We have lots of interesting displays and demonstrations. If the weather appears to be dangerous, then we will close. 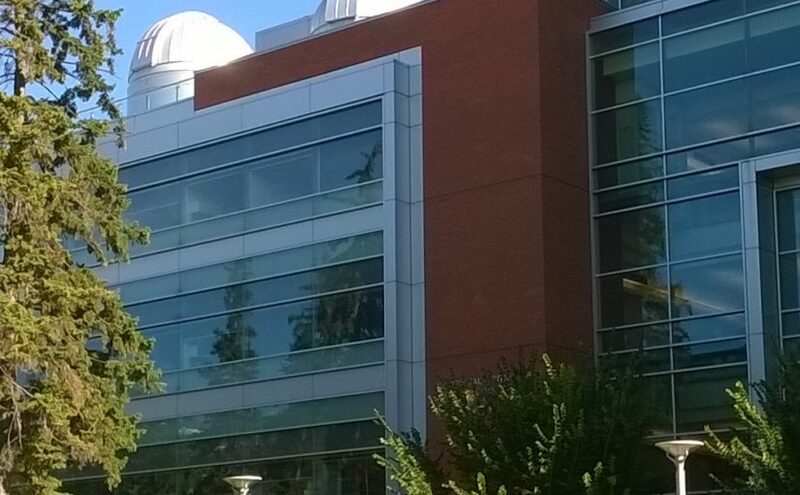 A: The telescopes are outside, and the domes are not heated. So wear warm clothes since it can get very cold! Q: Are high-heeled shoes appropriate? A: No. The floors of the observatory’s domes are a metallic mesh, perfect for high heels to get caught in. Please wear flat bottomed shoes, since high heel shoes are dangerous in this environment. Q: Is the observatory accessible to someone using a wheelchair? A: Yes and No. The exhibit hall, theatre, and the outside deck are wheelchair accessible. However, the domes have stairs and are not accessible. Let us know ahead of time that someone with accessibility issues will be visiting, and we’ll hook up a video camera to one of our telescopes, and you can observe the stars in the theatre. Next Next post: Power Up!